Content is the fuel that keeps your site running. If you’re planning to do a personalized health insurance websites for agents and want to embark in the online marketing ship, you’ll need to learn to do content the right way! This way, you’ll get more traffic, which means more potential leads coming into your site! You’ll find a list of reasons to invest your time and attention on content, in this post about the Top 10 Reasons to Take Advantage of Content. Nonetheless, content can be complicated: it needs to market your business at the same time that it gives value through compelling posts to your readers. If you’re a bit stuck on how to achieve this, don’t worry! In this post you’ll find some tips and content inspiration that can help you in improving your marketing efforts. Before moving on to the content inspiration, I’ll go over some basic tips that will help you get started in content with the right foot. 1. Speak to your target audience. 2. Remember that images and video are also content and you should use them to have a more dynamic blog. 3. Use hard data to make your point. 4. Keep a friendly, approachable and professional voice. 5. Give a spin to your content ideas: fit them to your local audience or think of a new angle to make them more specific. 6. Remember to add your basic information to your site (phone, types of insurance coverage you offer, your credentials and testimonials!). 7. If you need more inspiration, you can always look at what your competitors are doing. Now, for the content inspiration! In this section of the post, you’ll find several ideas that can help you move forward in your content strategy. Remember that you should take this and make them your own, give them a unique perspective and customize them to fit your local audience! Now, without further ado, here are the content ideas! Health and insurance are areas that present a lot of options in terms of content: from posts related to insurance to others that offer tips on how to take better care of yourself. Be it by a step by step guide or by providing pointers, tutorials and tips & tricks should be light posts that give the visitor an easy but highly informative read. These could also be in the shape of “Do’s and Don’ts” or “Top 10” posts. 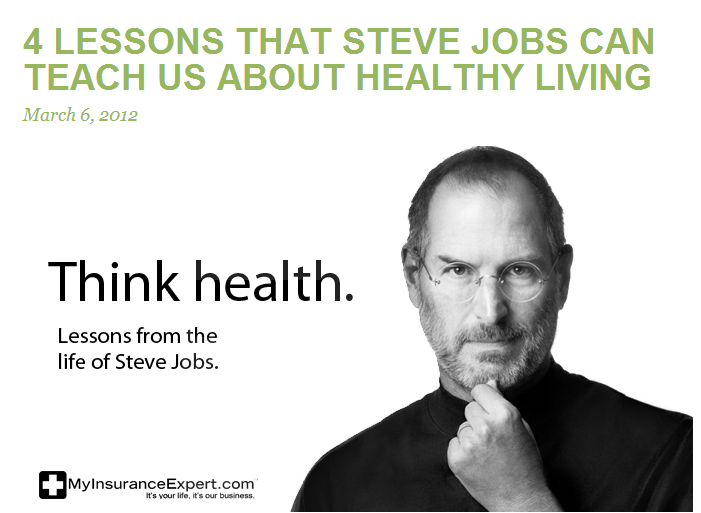 In this next example, this insurance agency took a highly covered news (about the passing of Apple’s CEO, Steve Jobs) and turned it into a post about healthy living where they point out some of the key personality traits Steve Jobs had and why you need them to have a healthy lifestyle. Health is a very delicate issue because being healthy should be the first priority in everyone’s book. Without it, nothing else makes sense. Still, to stay healthy (or to stop being sick), you need to make a considerable investment. That’s why your clients may have a lot of doubts and concerns regarding health insurance. By answering their questions, you’re giving them value. This is an easy source for inspiration because you already know that they are interested in knowing more about the subject. Plus, it can be a common concern, so by posting about it, you’re foreseeing other clients’ necessities. This next idea draws inspiration from life around you. News for example, are an renewable source of content ideas. Everyday something happens that can impact people’s lives. From Obamacare to a new study on the effects from smoking cigarettes, there’s always new topic that need to be brought up (since health is such a basic need). Talk about them, give your own input and make sure you let your readers know how these affect their health or insurance. Another tip is to look for topic inspiration in trends. Be it in pop culture (there’s a healthy kick going on right now) or customer trends (have you been getting more calls from clients with a particular disease? 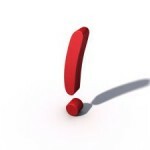 ), trends can help you write content about situations that are popular now. This next example takes a very popular discipline right now and lists the health benefits it provides. I’m aware that yoga is not a “trend” per se but, as I mentioned before, there’s a growing trend of healthy lifestyle and yoga has become a big part of it. By posting about it, you’re staying current and you’re relating it to your business. Lastly, there are events. Is there a fair going on in your city? Is there a big sporting event happening? Are you giving a seminar? Stay involved with current events in your area so readers know you care about your community. You could even write a bit on how to stay healthy at the next fair, for example. Make day to day life your source of inspiration! This is a no-brainer. Did you work hard with a client to get him exactly what they wanted and you’re proud of the results you achieved? By sharing real experiences, you’re showing your readers how you work and how you help clients. This is a perfect opportunity for them to learn about you! Just make sure you notify those clients to confirm they’ll let you share their experience! From time to time you may encounter a key piece of information that you think that anyone that’s interested in health insurance should see. Be it a video, an article or an info graphic, you should share these with your readers! By doing it, you’ll be spreading the word on something that you think is worth sharing in the health or insurance world. Plus, you can add your own commentary and write up a summary on that content. There goes an easy and friendly post! Remember, content can be the answer to all your marketing needs but you should take good care of it! If you do, it can bring you great benefits in terms of marketing yourself, getting quality leads and growing your business. And who wouldn’t want that? Just make sure you’re giving everything you got to content! If you’d like to read a post about content inspiration for Life Insurance and P&C, click on the links! If you’re interested in a similar post aimed at another type of insurance, let me know in the comments below.